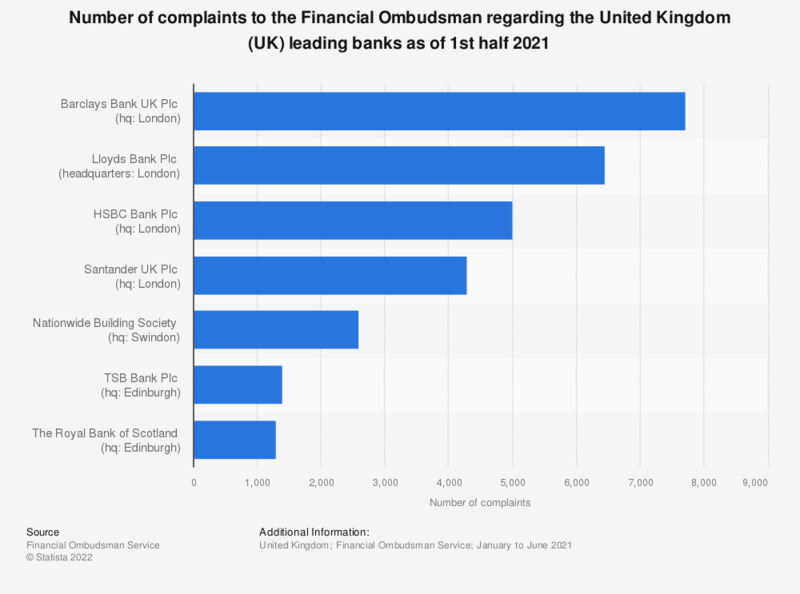 This statistic presents the number of complaints to the Financial Ombudsman regarding the services offered by leading banks in the United Kingdom (UK) in the second quarter of 2017. In that time, approximately 17.1 thousand complaints were filed against Lloyds Bank Plc and a further 13.3 thousand against Barclays Bank Plc. * 1st July to 31st December 2017. Number of complaints relates to the total number of of new cases received by the ombudsman service in this six-month period – from consumers dissatisfied with the financial business’s response to their complaint. This number is likely to reflect the size of the business involved. Everything On "Barclays Group in the United Kingdom " in One Document: Edited and Divided into Handy Chapters. Including Detailed References.